If you are like me, you criticize your favorite team's general manager and on-field manager (or coach for non baseball leagues) with every move they make. "We signed the wrong guy." "Why are you batting him third tonight if he can't hit lefties?" Well, now is your chance to be your own general manager and game manager! Salary cap leagues allow you to choose your team based on the funds available to you, and YOU make your lineup. This is the world of daily fantasy sports games. It is an adrenaline pumping thrill ride where one at-bat or hail mary can mean the difference between making money and losing money. Draftkings offers salary cap games like these every day, and they offer lots of them! Participants have the choice of playing in football, baseball, basketball, golf and hockey leagues. 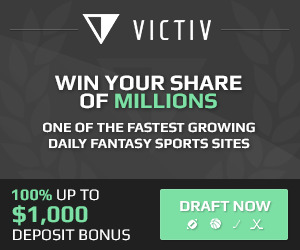 This includes daily fantasy college sports as well! The rules of a salary cap league are fairly simple. You have a budget and you choose your roster, staying within that budget. The roster is good for the respective day's games only. Player stats equal points and those who have the most points at the end of the day are deemed winners of their leagues. There are guaranteed payout tournaments (GPP's = Guaranteed Prize Pools), which are large tournaments, where only about the top 10% get winnings, and there are smaller tournaments of the same ilk. More conservative tournaments exist for those of us who want a greater chance of winning money. These one day leagues are called "double ups" and "head to heads". Double up tournaments using salary caps have a fixed amount of entrants in which half of the field win double their entry fee. Head to head is the same concept, with just two entrants. The more interesting factors are the dynamics of these different salary cap leagues. There is no set proven strategy, no matter what you may have read, for winning either type of league (tournaments or double ups). However, the nature of each respective game does lend itself to choose certain types of players. You will find OODLES of articles in the left menu of each sport on RotoPicks.com offering tips, advice and strategy to help you increase your chances of winning. Better yet, we're always creating more each month! On what we believe to be the best daily fantasy sports site on the web, Fanduel, guaranteed payout tournaments (GPP's) are large tournaments where only about 10 percent of the entrants win money. That means you need a big score to cash. Double up tournaments allow half the entrants to win. So that means you do not necessarily need a huge score; you just need to be better than one out of every two people. (In my estimation, this is the best/easiest way to make money playing DFS). Therefore, high risk high reward plays are the best plays for tournaments and low risk players (even if they have a low ceiling) are best for double ups. There are many strategies regarding allocating your salary to fit under the cap. For daily fantasy baseball, you can grab the best pitchers and sacrifice hitting, grab two starting pitchers and a cheap closer so you have room for better hitters, etc. For football, you can load up on the best 2 QB's on the board and then scrap together the rest of your lineup, althought this style of play is not advised! The bottom line is that YOU make the choices! There is no right way to make a team, but there is an important concept that helps me construct a lineup. As explained in "How Fantasy Sports Betting Works", stats have a given amount of points, so if you project a certain batting or pitching line for a player, you can calculate the amount of points he would get. A useful strategy is to do this and then divide projected points by salary (take away the zeroes in the salary). This gives you a multiple for a given player and you want to shoot for the highest possible multiple. For instance, Babe Ruth is $7,000 and you have a feeling he will go 1-4 with a solo home run. This is 7 points. Your multiple is 1. Daily fantasy football is a bit different. The multiples are higher. Each site has it's own salary cap so this number will vary. The trick to salary cap leagues is to get the highest multiples, as we just talked about, per player, while staying within the cap. If you think a player might get a couple singles and maybe an RBI, but his salary is $9,000, the multiple might be a bit overpriced (smaller than 1). Using daily fantasy baseball as an example, where do we begin? I suggest beginning with the most expensive pitching positions. Choose a couple starting pitchers in the middle tier. Next, slot in those studs. These should be hitters with extremely good track records, splits, and matchups. Finally, fill in the gaps with players whose multiple is high; i.e. their price is relatively low to what you predict their output to be today. If you run over the cap, do not worry. Setting a salary cap lineup takes time. It is like a puzzle, and you have to fit in the perfect pieces in such a way that the overall picture is a winning lineup that falls within the salary cap. If I told you, I was able to make a lineup without switching out at least one player, then I would be lying. Note: Be ultra sure that you're under the cap before saving your lineup. I've seen players be disqualified for not having a legal lineup on more than a few occasions! Salary cap games are fun because of this aspect. Constructing a lineup is an exhilarating process, and if your players perform, it is just that much sweeter. But most importantly, have fun, even when you lose. Take your time building a lineup, researching, experimenting. Eventually you will develop your own winning system, as there is no right or wrong way to make a salary cap lineup. For those of you who are absolutely in love with the concept of daily fantasy sports salary cap leagues, I'm going to let you in on a huge tip. It'll cost you though! --> Learn from Winning DFS Players.